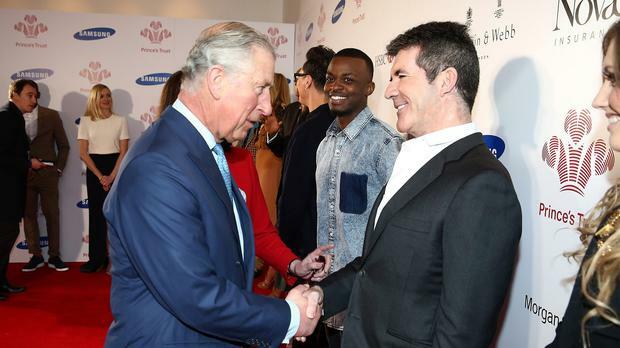 X Factor supremo Simon Cowell told the Prince of Wales that meeting young people helped by the Prince's Trust charity made him "proud to be British". Cowell echoed the words of veteran rock star Rod Stewart and his wife Penny Lancaster-Stewart as they praised the achievements of disadvantaged young people helped by the charity at a star-studded ceremony in London's Leicester Square. The singer and TV star were joined by famous faces including actor Kevin Spacey, former Arsenal footballer Thierry Henry and Strictly Come Dancing judge Darcey Bussell for the Prince's Trust & Samsung Celebrate Success Awards, which pay tribute to youngsters who have coped with issues such as drug addiction, abuse and homelessness. Speaking before the ceremony at the Odeon cinema, Cowell said Charles's work with the charity was "fantastic". He said: "I admire what they are doing and I think they do a great job. It is great for the country and great for the kids." Cowell also gave his support to suspended BBC presenter Jeremy Clarkson, saying the British public appeared to be backing him, but he would not be drawn on what his fate should be. He said: "I like Jeremy. He has said some stupid things and he knows that, but he's apologised. I think what is quite obvious is the public are behind him. But that's Jeremy." Introducing the awards, hosts Ant and Dec joked about borrowing the stairs for the ceremony from Britain's Got Talent, thanking his highness "Simon Cowell". And in a reference to Madonna's tumble at the Brit Awards, they said they hoped the ceremony would pass incident-free as the prince had left his "Armani cape" at home. The awards, held in front of a 1,600-strong audience, were given to young people in seven categories. Educational achiever of the year was Greig Watson, from Scotland; the breakthrough award went to Natalie Coffey, from Northern Ireland; the community impact award was won by Hemel Hempstead team three; Kerry Harkins, from the West Midlands, won the enterprise award; Michael Tyler won the flying start award; and Emma Reilly was named young ambassador of the year. The main award, the young achiever of the year, was won by Joel Fields, from Birmingham. The 18-year-old overcame a violent childhood that saw him put into care at seven and feeling unable connect with anyone to gain a job at Marks & Spencer after taking part in a Prince's Trust employability programme, running a customer services department. Speaking after receiving his award, Joel said: "When so many doors were closed, the Prince's Trust gave me an opportunity to show what I can do. I am going to follow every single dream I have." During the ceremony, which included performances from Brit award winner James Bay and singer-songwriter Ella Henderson, stars paid their own tributes to the young people's achievements. Arsenal legend Henry - who looked bashful after a star-struck young woman shouted that his suit was "amazing" - called them all "heroes", while Stewart and his wife, both long-term ambassadors of the charity, said seeing the achievements of the young people made them "very proud to be British". House Of Cards star Kevin Spacey added: "I have been an ambassador for the Prince's Trust since the very first awards a very long time ago and I am very pleased to be back again today." Introducing one of the awards, Cowell said: "One of the earlier winners said, 'You have got to believe in yourself', but you've also got to have an arm around you to do that." Following the presentations Charles, whose charity, founded almost 40 years ago, has helped more than 800,000 vulnerable youngsters, jokingly thanked Cowell for providing what he thought was the X Factor set, saying it was "about the nearest I am going to get to it", and Ant and Dec for their "remarkable, sparkling wit and repartee" to the event. He joked: "It is quite interesting to think that they were actually born at the same time that I started the trust, which really must be only 20 years ago, I suspect." Charles said: "My trust supports 58,000 disadvantaged young people every year to overcome, literally, unimaginable odds, as we have heard something about this afternoon. "Personally I couldn't be more proud that since 1976 we have supported some 828,000 vulnerable young people to turn their lives around. "However, on a day like this it is important not to forget the hundreds of thousands of young people out there who urgently need our help." Among the other stars at the event were TV presenters Gok Wan and Gaby Roslin, former England rugby captain Lewis Moody, musicians Labrinth and former JLS star Oritse Williams, X Factor stars Ben Haenow and Fleur East and The Only Way Is Essex star Sam Faiers. The Prince's Trust helps give disadvantaged young people the skills and confidence to find a job, with three quarters of them moving into work, training or education. Samsung has supported the charity since 2012, providing "digital classrooms" and working on technology initiatives.